After playing a long dual series, the tournament between Sri Lanka and South Africa has come to an end. They have already played their last match and according to the last news, team Proteas was on the way back to home. In their last match, team Sri Lanka won T20I match against Proteas and along with that they have won the T20I series as well. Though, T20I series consisted of just one match and the Lions won the single match. 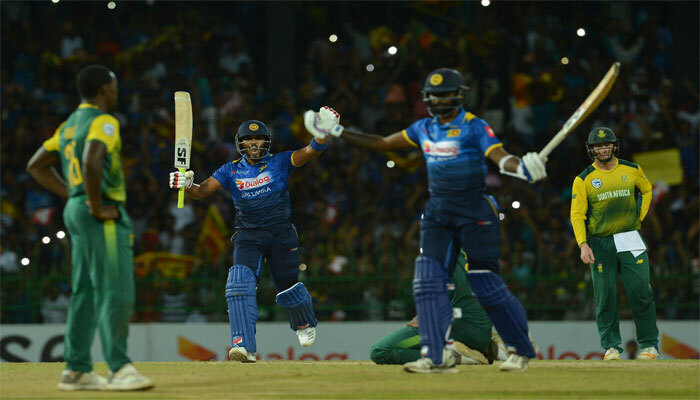 Earlier team Sri Lanka faced an ODI series defeat against the guest team Proteas but now, they returned to the competition winning T20I match. Sri Lankan cricket board invited South Africa to visit them in them and the purpose was to play a complete dual series between Sri Lanka and South Africa. Due to the purpose, Proteas came here and started the tournament with long format cricket. They also played warm up matches there before making the main event. The final match which was the only T20I match between the Lions and Proteas took place in 14th August, 2018 at R. Premadasa International Cricket Stadium in Colombo. It was also a day/ night competition where Proteas won the toss and let the Lions to bowl first. So, South Africa team came to bat at the beginning. De Kock and Amla opened the innings for Proteas. In 14 runs opener Amla was gone. De Kock scored 20 runs totally. Hendricks scored 19 runs and captain Duminy scored 3 runs only. Besides, Klaasen scored 18 runs and Miller scored 14 runs so far. Among the lower order, Dala scored 12 runs so far. They failed to play all 20 overs but played 16.4 overs and getting all out. They scored 98 runs totally. Sandakan took three wickets where Dananjaya and De Silva took two wickets each for the team Sri Lanka. They successfully tied Proteas innings so early. Perera and Mendis started to chase for the Lions. In 4 runs opener Perera was gone. Just two runs later, Mendis followed that way. Then Chandimal and De Silva made a partnership that added almost 55 runs. De Silva was gone scoring 31 runs and Chandimal remianed not out with 36 runs highest. Shanaka scored 16 runs so far. By losing seven wickets team Sri Lanka reached the target. They played full 16 overs to make the chase successful. Rabada, Shamsi and Dala took two wickets for the team Proteas.